Mortgage Refinancing PRO shows you if it makes sense to refinance your home loan! 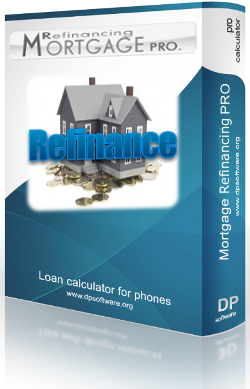 Mortgage Refinancing PRO is a smaller version of our full Mortgage Calculator PRO suite and is designed for people wishing to refinance their mortgage. When making the decision regarding refinancing and using this refinance calculator, you need to consider a couple of things. How much will it cost you to refinance your mortgage loan? Once you know these two things, you can determine if your accumlated monthly savings from refinancing will be enough to recoup the costs of refinancing your mortgage loan. Keep in mind however, that this calculator will assume that you have made all of your mortgage payments on time, as scheduled. If you have made a couple of larger than normal payments to pay-down the loan principal, or if you have made some late payments, your actual loan balance on your current mortgage loan could be different. Mortgage Refinancing PRO helps you assess the impact of mortgage refinancing. Enter your current loan information as well as the proposed refinance loan information to calculate the break-even point and potential cost savings from refinancing your mortgage.